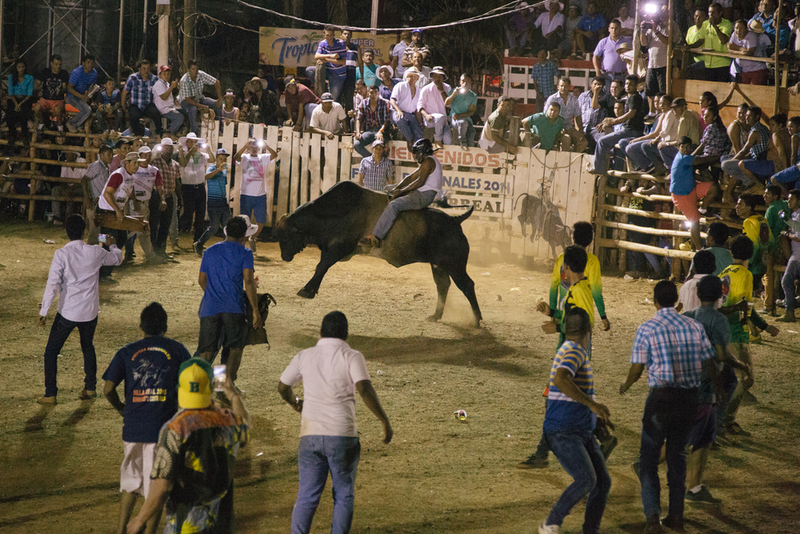 On a recent trip to the Costa Rica, I ventured one evening to the small town of Villareal, Guanacaste to take part in the local festivities of "Corridas De Toros" (a cross between bullfighting and a Texas rodeo). While the main event is the bull fighting, the arena is surrounded by other local attractions, rides, bars, outdoor dance floors and more importantly the smell of barbecue, offering a buffet of carne asada, fried chicken, arepas, carnitas and arroz con pollo. From the moment I arrived, it was amazing just to observe and photograph the festival as it was happening. As exciting and entertaining as the Bull Riding was, I found just as much, if not more, enjoyment observing the surrounding festivities and interaction with the local people. With sabañeros, ranchers, the brave agile youngsters, quiet observers, mothers and children and the very interesting Vendedores selling food and merchandise in the stands, it was a spectacle rich with culture unique to the region. See the full gallery and read the photo story here. ©2015 Nathaniel Schmidt, LLC. All Rights Reserved.